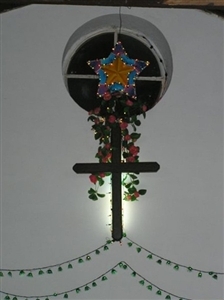 Public Christmas light displays like the one above are not generally found in Cuba because of poverty and religious customs. Only a geographical hop away, though, it’s doubtful that such lyrics would resonate with the people of Cuba. Between the early 1960s and late 1990s, public displays commemorating the birth of Christ were banned by the Communist regime, except in some tourist centers. Icel Rodriguez, Global Mission director for the Florida Conference who left her native Cuba in 1994, remembers that her family and friends did not even have the day off to celebrate. “If it was a weekday, you would have had to work that day and go to church in the evening,” she recalled. Fidel Castro, then president of the island nation, removed Christmas from a list of government-recognized holidays in 1969 because he said it interfered with the sugar harvest. 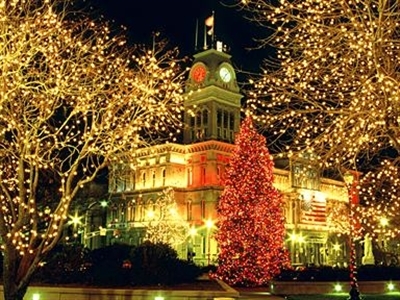 Castro restored Christmas to the holiday calendar in 1997 in honor of the visit of Pope John Paul II, and restrictions on public displays were eased. A small Christmas tree and modest decorations adorn the front of El Guatao Methodist Church behind speaker Caridad Jimenez in this Christmas 2007 photo from Sherry Mathews. Widespread poverty continues to make the celebration of Christmas a simpler, though no less joyous, affair for those who believe, said Pastora Noemi Caballero of the Methodist Church’s Havana district, through interpreter Sherry Mathews. “People have the day off from work, but really, there’s no Christmas celebration there unless you’re part of a church,” Caballero said. This month, Caballero, 48, has been visiting Highlands UMC, Jacksonville, the sister church of El Guatao Methodist Church, the congregation she serves with her husband, Rafael, in Cuba. It is her first visit ever to the U.S.
Mathews is a former member of Highlands UMC who recently moved but still assists in the sister church program. In Cuba, toys are available in stores, but most families don’t have the money to buy expensive presents, even for children, Caballero said. She and Mathews said some families give handmade toys to the children. Churches usually are decorated, though modestly by American standards. If the church has a tree, it is probably small and artificial. Because lights are expensive to buy and maintain, multicolored balloons often stand in. Celebrations revolve largely around the church, starting with Dec. 6. At that time, Methodists celebrate Christ’s birth with special music, prayers and dramas in churches throughout Cuba. On Dec. 15, all of the church members in each district get together at the district superintendent’s church. Representatives of each church present dramas or cantatas for the entire district fellowship, Caballero explained. At 6 p.m. on Christmas Eve, depending on each congregation’s resources, members will gather at their church for a special dinner, usually featuring roast pork and the Cuban staple dish of black beans and white rice, accompanied by dishes like yucca that church members bring from home. 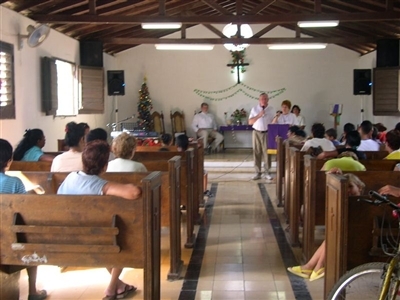 Bruce Stevens, lay leader at Highlands UMC, Jacksonville, addresses members of sister church El Guatao Methodist during a Christmas 2007 visit to Cuba. Photo from Sherry Mathews. On Christmas Day, church members gather again at 6 p.m. for a special worship service. Families that can afford it may have a special meal to celebrate Christmas. “Food is relatively hard to come by,” Mathews explained, adding that families receive ration books that specify how much food they can buy. Mathews said one of the first comments from Caballero when she arrived in Florida was about the Christmas displays. “She was amazed at all the decorations we have, and particularly the lights,” Mathews said. She said she took Caballero to the Festival of Lights at the Stephen Foster Folk Culture Center State Park, whose website advertises displays totaling 5 million lights. “They were just so very, very pretty,” Caballero said, as translated by Mathews. Mathews has visited Cuba on mission trips three times and plans to go again in March. In the meantime, she is scrambling to provide ball caps emblazoned with the name Jesus, a favorite in Cuba, as well as balloons, clothes and medicine that can go back with Caballero. Methodists in Cuba celebrate the birth of Christ with joy despite hardships. 2007 photo from Sherry Mathews. Methodist caravans in the past have taken microphones and telephones needed by the churches, Mathews said. Once they tried to take a water heater that was confiscated by customs officials. “There is not enough power,” she said. Financial help is always needed and appreciated, she added. Renee Kincaid, secretary of the Methodists United in Prayer Task Force that facilitates the covenant relationship between the Florida and Cuba conferences, said 162 of the 357 Methodist churches in Cuba have sister congregations in Florida. 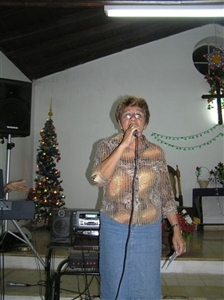 Churches interested in forging a sister church relationship in Cuba should locate their district coordinator for that ministry by clicking here. They can also reach Kincaid at rkinc@tampabay.rr.com or (813) 885-5674.